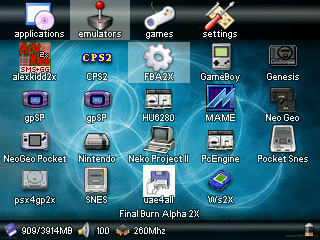 GMenu2X is a very very good alternative frontend for the gp2x. It supports overclocking, sound volume setting, touchscreen, etc. GMenu2X allows you to create direct links for your games & applications so that you can directly launch them without having to browse through all the filesystem manually, resulting in a better user experience. GREAT! I was just thinking on doing exactly something like this! I will try this immediatly. Thanks. Ok, now that I've tried I can comment :) This is missing an important feature, one that I thought when I was considering doing something like this: the ability to create links on the fly using some kind of combo of keys. This is very useful because if you could do this while browsing the SD, you wouldnt need to create the links using the PC, you just selected a file and then created a link for that.. What do you think? Amazing... quick, nice looking, all around excellent app. Opening a USB connection is much quicker through GMenu2x than the default frontend. Good job! COMPLETELY AWESOME! KEEP ON WORKING! The on-the-fly link making would be nice-- mabe a GUI? How do you uninstall this? I can't find any help on the website and no readmes came with it. Delet the autorun.gpu and the gmenu2x folder. Thank you, I thought as when I tried to turn my gp2x on without my sd card in that wouldn't work. I'm forced to put it back on, please put some way of uninstalling this menu. Its useless for me with out access to the file explorer. To be fair I really shouldn't have to resort to that. Flashing the firmware can brick your gp2x and should be done as less as possible. As I didn't have to accept any lisence when I used this I'd have every right to sue the author if it did brick my gp2x. For fucks sake, it's just a menu, it's not going to brick anything so stop threatening to sue, you fairy. Uninstalling is as simple as just deleting the files. If that doesn't help, there's something else wrong with your gp2x. Maybe check some more liscences so you know who to sue. ...I have it installed, i took out my SD card and rebooted, and it went straight to the old menu, as expected. It doesnt screw up the NAND in any way, its just using the SD autorun feature of the GP2x. I think something else is screwing with your unit. Many bugs!! But pretty good!! And then start odonata all people have bug!! The bug is (or was at least with v0.3) that nothing with TWO big characters would run - and odonata Demo was named ODONATA. Simply rename it and it works. gamemage: I got a blank screen too when I pressed the volume which changes the cpu speed. To get back the menu I had to press volume up once or twice and the menu came back. You don't have to reinstall the firmware or anything that extreme. love this! excellent. please get TV out working! I can't seem to get any links I make to accually enter. :( I used to be able to - but before I got this menu I installed the Ubuntu theme which I am having trouble removing Please help! Does anyone know if there is a way to arrange your links? Great piece of software. Its nice, but crashes on certain filenames. Its still quite nice. Nice work Ryo! Slick stable and such an easily changed background png... Thanks for your work on it! Great App! I notice a "problem?" with the usb connection. When i connect with usb (sd) via gmenu2x and add some files, the files are not visible after disconnect. I have to restart the gp2x to see the files. I finally managed to get around to trying GMenu2X and must say that this is the best launcher so far, complete with all of the features that I could ever desire. This app even includes CPU overclocking, automatic scanning for programs, and built in shortcut editing features, which make this app a must have for people who are on the go and can not be bothered to edit shortcuts or write scripts for overclocking with some games at home. excellent! just one problem... all of my dosbox games stopped working, strange!? Can someone send me the 2.1 patch? The download site for it (https://www.gp32x.com/board/index.php?showtopic=32338&st=45&p=467007&#entry467007) seems to be down (got a 404 error) andrewtheartist@hotmail.com Thanks! Hey for some reason the usb options under Settings has disappeared (ON, OFF). I had to redownload it and was wondering why I no longer have those options? Someone help me! If you haven't already done so download this now. You'll never go back to the original gui again. So much easier to use. I saw this a while back and some of the messages here put me off! I took a good look at it and it's an application launched by autorun.gpu that writes to its own folder. If you don't want to use it after installation then go to the GP2X settings and disable autorun OR delete autorun.gpu from the root of your SD card (or NAND if you installed it there) and remove the gmenu2x folder: it's that simple. You DON'T need to flash the firmware!!! I like this application very much. It works, it's very functional and looks pretty. It's a massive improvement over my standard 2.1.1 interface. When adding a link, the volume is set to -1 (default) but when exiting creation of the link the volume on the status bar is 100. Sometimes pressing A + volume up/down to increase/decrease the volume of the selected application also affects the cpu Hz in the status bar. Firstly it works, then I take my finger off of the volume button but still pressing A, I then press the volume button again and it is unpredictable whether the volume or Hz will be affected. Running Crimson Fields and then returning to GMenu2x causes GMenu2x to flicker. So far I've only found a reboot to clear it. It is sometimes possible to see the screen contents of a previous app flash up when launching something else. 05-31-07: nice application. the liquido skin and other available icons can help make Gmenu2X a bit prettier. This is a great app, thanks Ryo. A quick question to anyone; is there any way of sorting your icons in order after changing the icon name? They seem to auto-sort before customising the names, but not after. Great frontend but I'm having a problem that is driving me CRAZY! There are 3 atari emulators which all use the same interface (2600, 7800 and st). They all launch fine but when I try to re-launch the emulator it crashes everytime and I have to restart my gp2x. With the default launcher I can relaunch the atari emus multiple times during one session but with this frontend it always crashes if I relaunch the emu during the same session (Ie: not turning off the gp2x and restarting it). I've spent days now trying different firmwares, different settings within the gp2x and gmenu and within the emulators themselves. The old atari stuff is my favorite and I REALLY like for this launcher to work with these emus properly. I have no problem with vice or mame or other emus, just these 3: GP2X-2600 GP2X-7800 Atari 800/5200 : GP2X-Atari They all use the same gui which doesn't seem to play nice with gmenu. There are alternative emus but the gui on these are really easy and intuitive. Does anyone have any idea how I can fix this bug or is anyone having the same problem!?! Any help would be GREATLY appreciated! Does this work with firmware 2.0.0? Really amazing!! when it will goes with the touch screen of F-200? Very nice ! First time I've used this and its easily better than my old menu. Got a a couple of requests: * A confirmation message for when you delete a section, It does not currently ask and it is easy to delete your links by mistake. * Maybe a way to re-order your shortcuts like moving files up or down. Or simply by having preset options (Alphabetical, Date added, etc) Thanks ! Has anybody been working on this project lately? There has been a few requests for touchscreen support. I just my new GP2X F-200 today, giving my old F-100 as a b-day gift to a friend. I really like Gmenu2x, all it lacks is touchscreen support. It would make it simple to edit the menu on the GP2X, as the on screen keyboard can actually be used. I love this program! you're the best. Now with touchscreen support, yay! This thing rocks! good work Ryo! For some reason on my F-200, it does not respond to touchscreen. Is there an option I need to enable? I did notice that the battery meter on the F-200 now works in Gmenu2x. My touchscreen does work in the original menu, Exult, and OpenTTD. Just for the battery update for F-200, it's worth an upgrade to. I love Gmenu2x for its superior usability and have used it for ages. Alas, I use my GP2X frequently for VJing (with Pikix), and the TV out incompability renders it pretty much useless here. Since Gmenu is the main launcher for Open2x, I won't be able to flash it (which i'd love to) because I won't be able to quit it and use the original firmware's TV out. Please, Please fix this. I'd really love to use Open2x. Please help, i have firmware Ver 2.1.0 and i put the folder gmenu2x and the file autorun.gpu to the root of my SD, and all i get is a black screen. plz help.